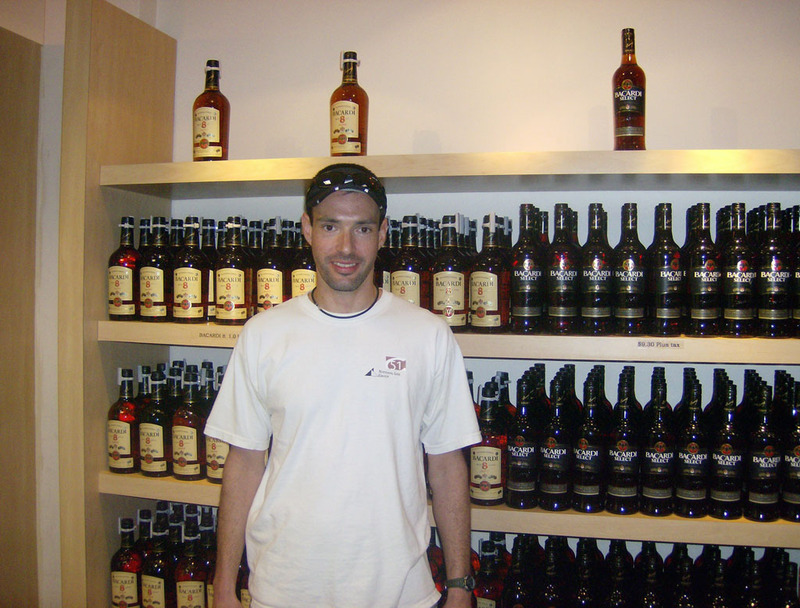 I am a big fan of rum, but not a big fan of the Bacardi line of rums but I figured it would be fun to see the mega-facility anyway and it would be better than anything else I could do in San Juan, aside from shop for other local rums, which I should be able to do on my way back to the ship anyway! Unfortunately we were going to be docked in Old San Juan at night and the distillery visiting hours were only until 5PM. I was a bit disappointed but then received the list of tours offered by the cruise line and alas, there was a private after hour’s tour of the distillery. It was a bit pricey but after looking at the limited options offered for San Juan (tour of Old San Juan, or shopping tour) I decided I should do it, especially since I never made it to the distillery in Nassau on last years’ vacation. My wife and daughter had no interest in going, so I signed up alone. I disembarked the ship and walked to the end of the pier where we were to meet. There were about a dozen of us on the tour and we were to take a boat across the harbor to the ferry pier where we would be picked up by a mini bus which would take us to the distillery. The boat across was pretty rickety but seemed capable (I’m glad there were only 12 of us). They played some Caribbean music and served some pretty bad rum punch on the way over but the views of the walled city of Old San Juan were magnificent. 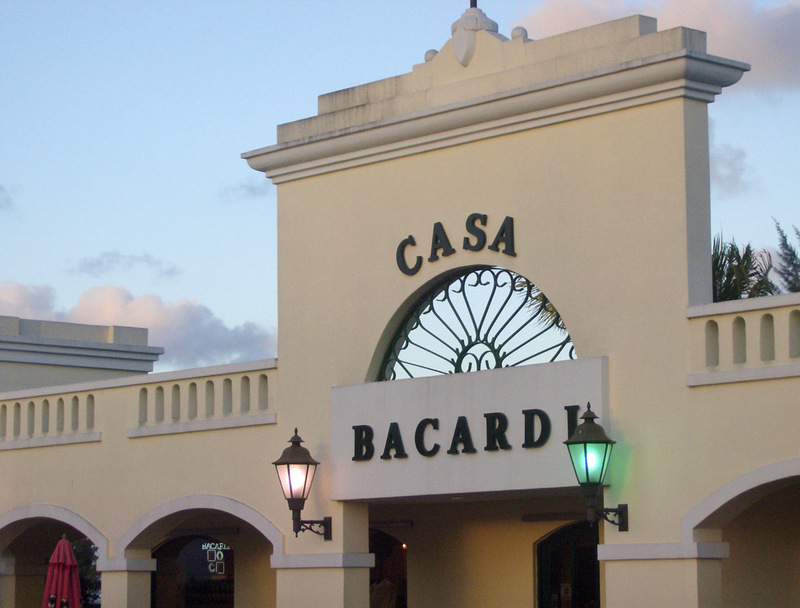 We made our way through the neighborhoods of Cataño to the Bacardi compound. Once inside the perfectly manicured grounds we were dropped at the visitor’s center where the tour was to begin. We boarded some small tram type cars for a short ride to a larger visitor’s complex and were escorted inside. 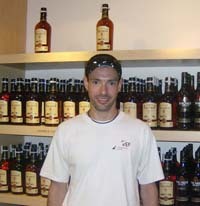 We were greeted by a very friendly Bacardi employee who was to be our tour guide. 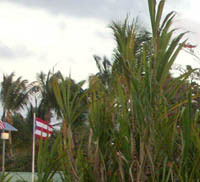 He led us into the courtyard surrounded by 3 large murals depicting the beginnings of rum – the discovery of America and PR, the growing and refining of sugarcane (thus producing molasses) and the rise of piracy. He explained the beginnings of rum and ‘kill-devil’ and the history of rum. Having just finished the book ‘And a bottle of Rum’ by Wayne Curtis, the history was fairly concise. Next we went into a small theatre to watch a short film on the history of the Bacardi brand and their beginnings in Cuba and subsequent exile to Puerto Rico, as well as the Bahamas and Mexico. 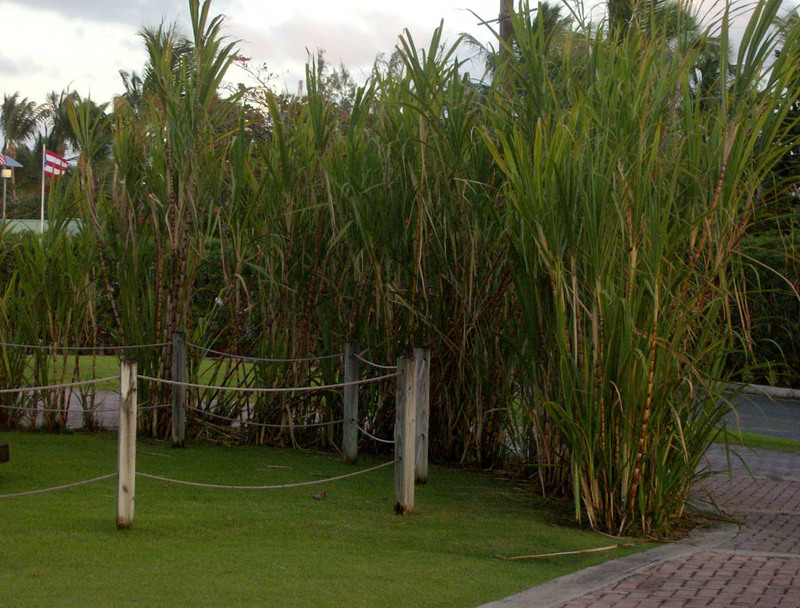 We then entered an area with a re-creation of some of the first Bacardi stills, some company memorabilia, as well as a room that had TVs set up in various languages that went through the entire process of making Bacardi rum, from the sugar cane and molasses all the way through fermentation, distillation, blending, aging, bottling, etc. It took about 15 minutes to run through all of the parts, but it was pretty well done and informative. Also in this area was one of my favorite parts of the tour. They had small oak barrels at all stages of production set up to sniff - raw sugarcane juice, molasses, fermented ‘beer’, distillation product, aged product out of the barrel and blended rum ready for bottling. I thought it was pretty cool to be able to smell the different stages along the way. Next up was their lounge area, which is not the tasting bar but rather and old timey like lounge with lots of prohibition pictures and an old bar where they demonstrated the making of some of the cocktails and talked a bit about the Bacardi line of rums. From there, we passed into the promotions room, where they had tons of memorabilia of vintage advertisements, old labels, some of the old bottles, TVs with ads running and tons of logo recognition material. t was somewhat interesting to see the really old ads and the evolution of the logo and bottle labels over time. Exiting the building, we boarded the trams and went for a riding tour around the rest of the complex. We didn’t stop anywhere else, they just pointed out the fermentation tanks and the huge fermentation and distillation building. As we passed by we were able to catch a glimpse of the absolutely colossal still columns in the back of the building. We went by the blending and aging warehouse and finally ended back at the visitors’ center. We were given two tickets to trade in at the tasting bar for drink samples and then let off at the Bacardi store. In the store they had everything from hats and shirts to bar equipment to the full line of Bacardi spirits. They also had Bacardi ‘Special Reserve’, I think it was called, that they said was only available at the distillery and was aged 12 years, selling for $70US. I made my way out to the tasting bar after a brief look around the store in the mood for a nice mojito after seeing those wonderful ads several times in a row in the promotional room. I was quite disappointed when I saw that the bartender was not muddling up limes and mint and sugar for the authentic, straight-from-the-source mojito that I was expecting, but rather pouring it from a spigot in a big glass tank. How lame is that? I suppose it had to be done for large groups of visitors during the day but still for a company tied closely to the mojito it seems shameful! Nevertheless it was not that bad. The ones I had sought out at the appropriate authentic mojito making bar on the cruise ship were much better as are my homemade ones but it was still better than some I had had in restaurants back here in Massachusetts last summer. After that experience I decided to ask for a pour of the Special Reserve to give it a sampling. This was met with a scowl from the bartender – he clearly wanted to just keep the line moving and dispense pre-made mojitos or Bacardi Razz and Sprite. He eventually poured it in the glass and I sat down to give it a proper tasting. It was quite smooth and full of flavor but I thought it was pretty similar to the 8yo that they sell everywhere and at $70, it seemed a bit expensive so I passed on buying a bottle. I was quite happy that I decided to do the tour. It was interesting even though they were ultra secretive about everything – we were not allowed to take many pictures and a lot of information was only learned by asking questions and talking with our guide. I was also surprised that there was no mention, even when I asked about it, of the new lines of rum that are being produced right at that plant such as Rubi Rey, the new premium and supposedly a pretty good aged white sipping rum. Perhaps they want to keep the brands completely separate of each other. The distillery was a nice quiet reprieve from the craziness of downtown Old San Juan and worth a visit if you are there, even if you do not particularly care for the Bacardi products like me, the tour was interesting none the less. 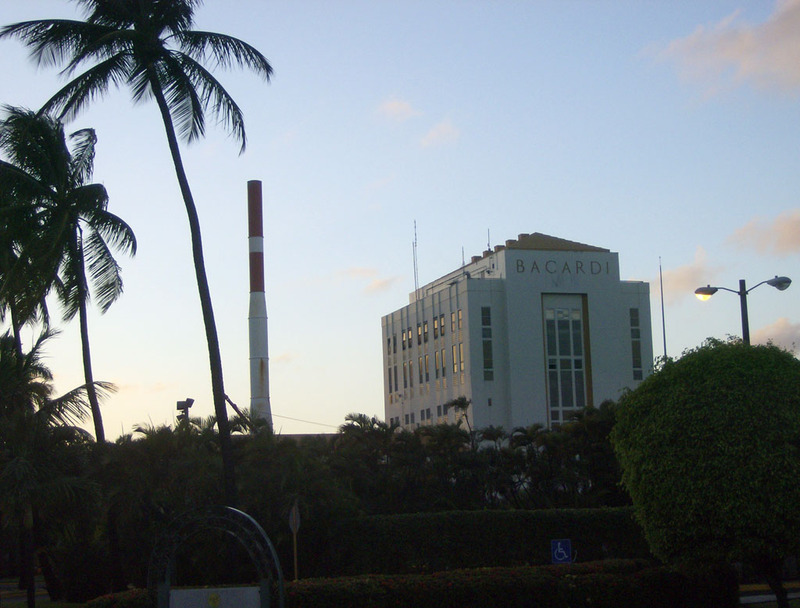 Have you visited the Bacardi factory? Was your experience similar? Talk about it in the forums!